Wild suggestions of ways you can have a camp experience at home and in your nearby community. 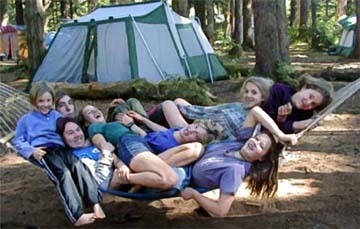 California homeschoolers shortly before the hammock broke. September campout at Patrick’s Point with HSC. Help the driver navigate to all the fun places you go this summer! A soap bubble actually is a sandwich of air on the inside, a layer of detergent molecules, a layer of water and finally another layer of detergent molecules. Directions and rules to favorite children’s games. Find the rules to your favorite sports. Learn to select quality equipment. Submit your sports stories. Learn to safely construct and launch model rockets at our online space camp. Safety and first aid games and a few downright serious lessons, too. I want to find out more about my favorite author or series. Recommended reading lists and reviews of children’s literature online. Links to reading list sites on Page 2. Arts and crafts activities for kids, with a touch of art history thrown in for good measure. Learn from top cartoonists how to draw comic characters. Free online art lessons. Dinosaur crafts, clip art, and learn to draw a tyranasaurus rex or make dino crafts. All you need to make your own instruments for your neighborhood band. Fun recipes for kids to make with a little help from Mom. How making homemade ice cream can help you learn chemistry concepts. Observe birds close to home or with a web cam. Help with counting them, take a quiz, or even pretend to be a penguin! Insects in general, with new pages for ants, bees, beetles, butterflies and spiders. Learn to ride and care for a horse. Find out about prehistoric horses. How rocks are formed. How to identify them. How to collect them, and find other collectors. Trees are alot like people, only slower. Find out how they work. Selecting and fixing your bike. Safe and fun biking activities. Homeschoolers haunt this historic gold mining town. An online field trip. Kids’ love of small, tight spaces lead them to love to learn about caves, the natural play forts of even grown men at times! Lessons in survival in the school of nature. Resources for homeschooling boys and their leaders. Help establishing troops for homeschoolers. Home-based driving instruction…. while the weather is good! Resources for homeschooling girls and their leaders. Help establishing troops for homeschoolers. Earn 4H or other youth group requirements, rank advancements and badges while at camp. Free dry land lessons in boating safety, techniques, boat parts, sailing, rowing, and paddling. For kids who have pet fish or enjoy catching or learning about all sorts of fish. Do You Want to Learn to Row? How to find a rowing club and learn how to become part of a crew team. Frogs are disappearing at an alarming rate. Find out how you can help save them. Investigate our waterways and learn to keep our drinking water pure. Learn about creatures of the deep: whales, sharks, sea otters, jelly fish and creatures of ancient seas. Travel in submersibles and other ships. Find out more about waves, currents and tidal forces. Water safety and resources for improving your swimming in a pool or at the beach. Have a flair for drama? Put on a play with these scripts and staging ideas. Learn how to prevent a fire, and what to do if you are caught in one. Free lessons for folk instruments such as guitar, banjo, drums and whistles. Lyrics for favorite kids and teen songs. Come sing along or take a music lesson. Stars and groups of stars all have names, and the stories behind the names go back to the times of the earliest star gazers. How to become a sidewalk astronomer by finding a group and maybe making a telescope.